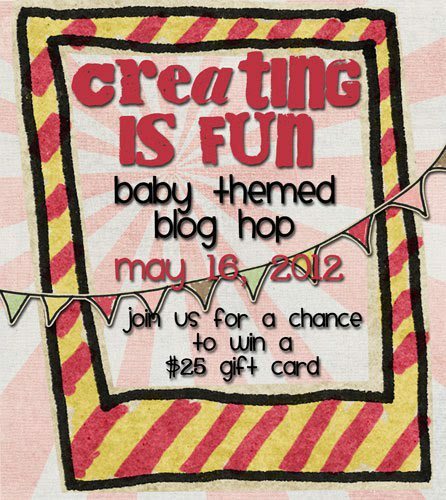 Thank you for joining us today for the Creating is Fun Design Team - May Blog Hop! Today we are all sharing Baby themed projects. One lucky commenter will win a $25 gift certificate to the shop. All you have to do is follow and comment on each of the blogs. Martha will choose a winner. Also, some of the design team members are giving away blog candy! For the rest of the week, Martha will be having a 20% off sale on ALL BUTTONS! So make sure you hop on over and check out what is in the store! If you are following the hop, then you just came from Rebekah. Fun Zibbet Shop. I finished it off with a stick pin, a glittered button and some bling! Next, I made this gift card holder using a 4" x 10" piece of printed paper. I embellished the outside edge with my favorite coral pink trim from the shop. I scored on the 10" side at 2", 5" and 8". Here is a look at the inside. I punched the end that will hold the gift card with a circle punch. 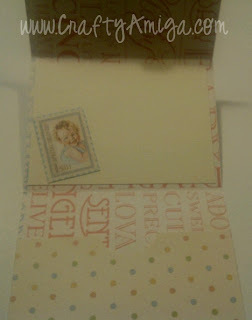 Then, I put a blank piece of card stock in the middle so that you could write, or stamp a sentiment. To finish it off, I used a velcro circle to keep it closed. I hope you enjoyed my two projects! Next, you will be visiting Ashley. Here is the blog list of all our Design Team Members. 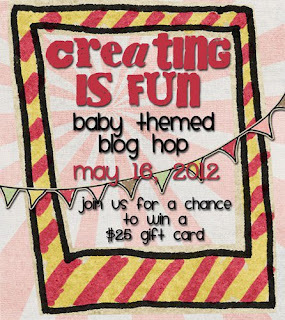 Make sure you check them all out for plenty of baby themed inspiration! Enjoy!! I hope you visit again soon!! This is so pretty! I love that paper. I also love your masculine post before this one! I am going to have to bookmark those to make my dad's cards! Thanks Rachel! Those masculine cards were not easy! I am a glitter and lace kinda girl! It was hard for me to create without either! Thanks Martha! And thanks for allowing me the opportunity to be on the DT! Love these cards....but then again, i love all your work girl!! 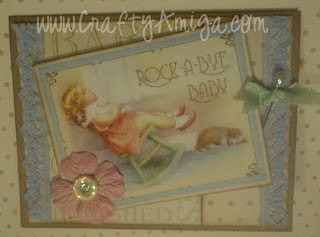 So sweet, love all the soft colors and the great trims! This is super sweet! Just the perfect colors for baby! Very great card. Love the trims you used. Hi! 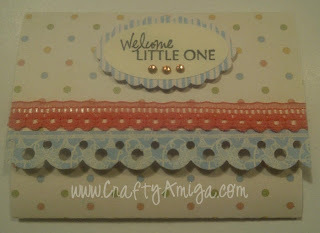 I totally love your card, great color combo and design!